Oslo (Norway) – March 22, 2019 (travelindex.com) – You have enjoyed them, but you might not realize that the orange fish that tantalizes your palates, fulfilled your tummies, and essentially warmed your hearts as you dine at your favorite Japanese restaurants, or the ones that you bought from Thailand’s leading supermarkets and outlets are “Norwegian Salmon”. Book your hotel in Norway and around the world in 99 countries at best rates available. Earn HolidayClick Points and pay at the hotel. Book now at HotelWorlds.com! What makes Norway “Country of Origin” for salmon and seafood? Pack your bag and let’s see how a journey of salmon begin in Norway and goes all the way to Thailand. Sustainably Farmed Norwegian salmon delivers a delicate taste and texture that comes from a slow, natural growth process and exceptional regulations to ensure sustainability, quality and safety. Since the 1960s, local farmers along the coast of Norway have carefully bred salmon. The fish live in a ginormous penthouse, or “pens” to prevent overcrowding and ensure enough swimming space as ocean net pens contain maximum 2.5% fish to minimum 97.5% water. These pens provide the time, space and opportunity for the Salmon to fully mature. Salmon’s life starts from roe, to fry, to smolt, and finally maturity. Ranging from 2.5 to 3 years, farmers spend time pampering their salmon with EU-standard delicacy: the heat-processed and highly nutritional feed pellet that contains 70% sustainable vegetable raw materials and 30% sustainable marine raw material plus vitamins, minerals and antioxidants. Along the country’s long coastlines, the pristine waters of Norway are surrounded with snowed-capped mountains which allows for the flow of cold, clear water and temperature that is perfect for salmon farming. Salmon live in the waters from 6 to 15 degrees Celsius. The corpulent salmon are opulent with Omega-3 that helps reduce heart disease risks and improve eye sight, B vitamins that help repair DNA, and vitamin D that promotes healthy skin. Around the world, millions of people enjoy seafood originating from the cold clear waters of Norway on a regular basis. Today, Norway is the second largest seafood exporters in the world, providing as high as 37 million meals fetched from Norwegian waters to consumers in over 146 countries each day. Indeed, you might have tasted Norwegian seafood already, without knowing it. Ocean harvest has not only been the key activity and sources of income for Norwegians generations over generations, but also their way of life. As Norway has a long coastline, Norwegians have always been a people of the sea. To pay a homage to the sea, Norwegians do not overexploit their natural resources and instead developed technologies for sustainable aquaculture and salmon farming. Combining hard-earned experience and advanced technology, the industry can monitor and promote healthy fish growth and food safety at every step, from pen that can endure up to 50 years of nature condition to the 24/7 VDO surveillance to monitor every single salmon in the pen. From salmon terminal in Oslo airport, Norwegian salmon take their first-class seats. It takes as little as 48 hours for fresh Salmon to be air-flown from Norway to Thailand, which ensures the freshest quality and taste before showing off their shiny marbled flesh on a plate before your eyes. According to EU regulation, any seafood consumed raw must be frozen first to ensure that any intestinal parasites remain are eliminated. What makes Norwegian salmon special is that it does not contain any parasites and is exempted from this regulation making it a safe option for sushi and sashimi lovers. The Norwegian Seafood Council (NSC) is a public company owned by the Ministry of Trade, Industry and Fisheries, and the world’s only national seafood council. 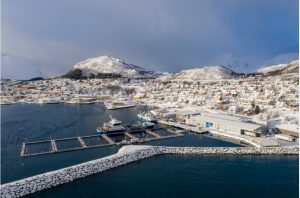 NSC works together with the Norwegian fisheries and aquaculture industry to develop markets for Norwegian seafood, representing the country’s seafood exporters and the seafood industry. The trademark “Seafood from Norway” is a symbol of origin for Norwegian seafood caught or raised in the cold clear waters of Norway.